What is the CCID (Card Identification Number) or CVV (Card Verification Value) and what does it look like? Visa, 3-digits in reverse italic to the right of the cc number in the signature area on back. MasterCard, 3-digits in reverse italic to the right of the cc number in the signature area on back. Discover, 3-digits in reverse italic to the right of the cc number in the signature area on back. American Express, 4-digits printed (not embossed) on the right front of the card above the cc number. Ordering a Gift Certificate is easy. We will email your gift certificate to the email address provided. If you'd also like a hard copy mailed please choose Email & Shipped below. We email gift certificates 8AM - 4PM CST. Mon-Fri.
Who is the gift certificate for? A $1.00 Postage fee will be included in total if you choose to have your certificate shipped. Ship to your billing address? As an added security measure, we ask that you enter an extra 3-4 digit number located on the back of your credit card, on or near the signature panel, called the CCID. 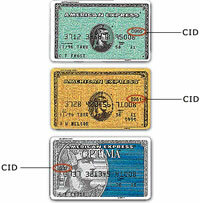 (American Express customers have a 4 digit CCID located on the front of the card.) Click here for a sample of what your CCID looks like.